In October I participated in the IFOAM Organic World Conference in Istanbul. The IFOAM World Conferences are not really about business even though some market data is available in some presentations. It is more about the content; about what organic farming and organics in general is about. There would be a lot to tell about, but here I want to talk about a book I bought there. André Leu is the President of IFOAM but he is also an organic farmer and he has written a book – published in 2014 – about pesticides: “The Myths of Safe Pesticides“. For someone like myself who has been in organics for decades there isn’t so much in the book that is really news, but putting it all together in a concise presentation of all the facts is impressive – and shocking. This is something more people should be aware of and therefore I’m doing my little part in promoting the book and giving a short review of the content. You should all buy the book from IFOAM and read it. In the following I’ll highlight some main points. Read the book for more details and the arguments for each point. 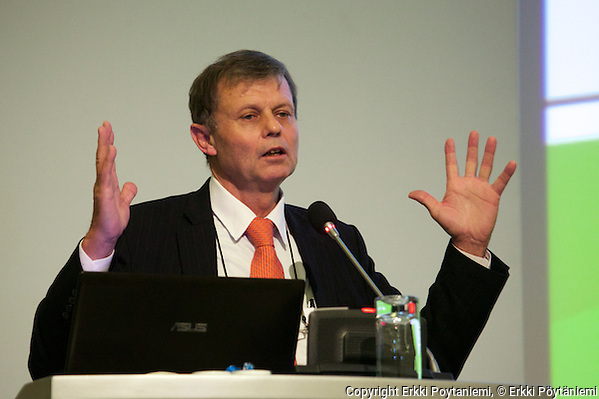 André Leu speaking at the IFOAM Organic World Conference in Istanbul 15th October 2014. Current toxicity testing fail to represent the nature of human exposure to chemicals. The actual chemical cocktails in food and water are not tested for. The combination of pesticides with toxins produced by GMO-plants (Bt) is not tested for. Only single active chemicals are tested, not the actual combinations that are used. F.ex. Roundup (commercial product) is much more toxic than glyphosate (active ingredient). Pesticides are compounds with active ingredients and “inerts” (solvents, adjuvents, surfactants etc). Only single active ingredients are tested even though their toxicity increases by multiple factors (up to 1000 x in some cases) when combined the inerts. Most inerts are toxic. Only acute toxicity is tested to determine the LD50 (lethal dose). Adverse effects must occur within 2 weeks of the chemical being administered to be considered. Other health issues including cancers, birth defects, nervous system damage etc are not considered. ADI (acceptable daily intake) and MRL (maximum residue limit) are not set for any formulated products – they are only set for the “active ingredient”. The vast majority of registered pesticide and veterinary products have not been tested. The special sensitivity of the developing foetus and newborn are not taken into account in testing. The testing is typically done with animals in their adolescence. Nervous system damage is not tested even though it is known that many pesticides function as nerve poisons that can affect adversely children’s neurological development. Pesticide damage can occur in subsequent generations. Most pesticide residues are below the ADI (acceptable daily intake) and MRL (maximum residue limit) set by authorities and therefore the food is said to be safe. However there are problems as described above. Especially the fact that chemicals can act like hormones means that much lower residue levels can be toxic. These are called endocrine disruptions. Can cause reproductive problems in humans and animals. Can cause decreasing age of breast development in girls and is considered a risk factor for developing breast cancer later in life. Can cause obesity and type 2 diabetes. Fetuses, newbores and growing children are most vulnerable. The dose-response is not necessarily linear; in some cases the lowest doses can be more toxic that higher doses. Glyphosate at residue levels commonly found in people induce human breast cancer cells to multiply – even more so if combined with genistein, a phytoestrogen found in soybean (glyphosate usage has vastly increased with planting of GMO soybean). Close to 800 chemicals are known or suspected to interfere with hormone receptors, hormone synthesis or hormone conversion. Most chemicals have not been tested. Regulatory authorities have no scientific basis or evidence supporting the assumption that exposure to chemical residues is safe at recommended levels. Most agricultural and veterinary chemicals leave residues in food (that’s why they are tested). Most pesticides leave residues of breakdown products or daughter chemicals when they degrade. Where there is any research, it shows that many of these metabolites cause health and reproductive problems. Many organophosphates’ metabolites are more toxic (up to 100 x) than the original pesticide. Apart from break-down products pesticides contain impurities and by-products from the manufacturing process which are largely ignored by regulatory authorities. These include dioxins. There is virtually no testing to detect residues and by-products of pesticides in our food and water and there are no safety levels for those chemicals. Because not all chemicals are tested for it is not correct to say that any food is free of residues. It is claimed that there is no risk when chemicals are used as per “Good Agricultural Practices”. However how farmers use chemicals is not monitored. In developing countries many of the farmers using the chemicals are illiterate and often also the sales agents who are supposed to advice them are illiterate. Consequently the highest rates of pesticide poisonings are among farmers, their families, farm workers and in rural communities in the developing world. In developed countries food is tested for residues. However food is considered safe if residues are below MRL’s. Weather residues below MRL’s are safe is highly questionable (for reasons described above). Regulatory authorities disregard a large body of published science that shows that the current methods of determining the safety of agricultural poisons are grossly inadequate. Instead authorities rely on unpublished industry studies commissioned for regulatory purposes. Authorities do not take preventive action but instead take action only after years of public concern of the civil society and scientific community. Regulatory authorities using unpublished, non-peer-reviewed, industry sponsored studies should be seen as a major problem in current regulatory decision making process. Organic farming methods clearly show that using pesticides and other chemicals in farming is not necessary. There are several examples of high-yielding organic systems from all over the world. Organic farming is successful despite virtually all agricultural research has focused on chemical industrial agriculture for the last 100 years. 85% of the world’s farmers are smallholders and 70% of the world’s food is produced by smallholders. Organic farming can increase production on smallholder farms up 3 times current production levels. According to FAO , with a more than 100% increase in food production in traditional farming systems in developing countries, organic agriculture provides an ideal solution to end hunger and ensure global food security. This is without farmers needing to rely on inputs they cannot afford. Pesticides can be replaced with non-chemical methods. In the above I have just picked some points from the book. I recommend reading the book with al the arguments and facts that are behind these points. In the meantime if you are not sure that pesticides and other chemicals are safe for you, our children and the environment, it might be better to avoid them. Don’t panic – eat organic!